One of the best ways to be prepared for the many uncertainties that life hurls at us is to grow our own food. Gardening can be a vital skill to learn ahead of time, before a disaster strikes. There can be a decent learning curve if you’ve never raised your own food before. You need to take the time now to learn how to grow your own food! Luckily, if your goal is to raise a survival garden that will keep you alive in an emergency there are a handful of easy to grow plants that can help sustain you during a disaster, and are easy to save seeds from to plant from year after year. For all of these plants, make sure when you purchase your initial seed stock that you pick open pollinated types. This means that you can save your seeds every year, and even build up a stock of seeds in your freezer in case of a crop failure, all with just one, single time purchase. Hybrid or F1 varieties of seeds will produce seeds, but when you plant them, you will not necessarily get the same variety that you had the first year. Another advantage of saving your own open pollinated seeds is that the plants will adapt over time and become more resilient to your particular climate. Don’t be discouraged if your first attempts don’t always succeed. Try again the next year, and the next, until you’ve mastered a few essential crops. Some people seem to have a natural green thumb, but there are others of us who need to learn through trial and error. If you’re new to gardening in general, and not sure where to start, check out Easy Ways To Get Started On A Spring Garden for ideas on how to prepare now, even if it’s too chilly to start planting. One of the best resources to have in a disaster situation is legumes, because they are a complete protein source when paired with other foods. Beans are also very easy to grow, and can produce a large crop. There are two types, bush beans and pole beans. 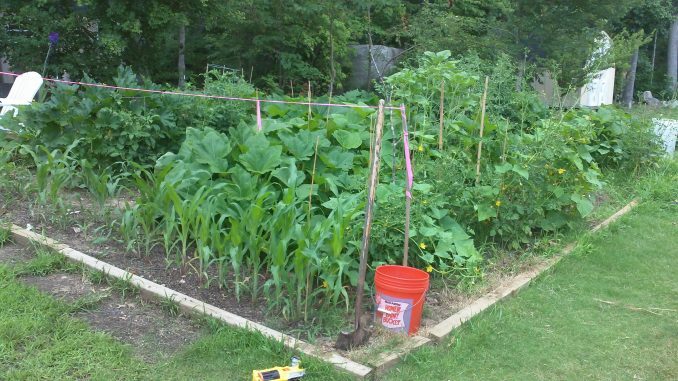 Bush beans will not need any sort of trellis, and so are probably the better choice for a scenario where you may not have many resources available. Of course if space is limited in your survival garden (such as an apartment patio), pole beans will make more use of your vertical space. You can also choose between snap beans or dry beans. Snap beans are meant to be eaten fresh and green, before the bean inside has matured. Dry bean varieties are most likely the best choice for an emergency situation as you can store them for long periods of time without cooling or preserving. Beans should be planted once the soil has warmed up a bit, and after there is no chance of a frost that will kill them. You can keep planting them in batches every few weeks until the middle of summer in order to increase the amount you harvest and grow all the way until your first frost in the fall. Plant them twice as deep as they are wide, and space them four inches apart. You can harvest the green pods as soon as you’d like to eat fresh. The plant will produce more if you pick them. If you leave them on the plant the pods will dry and you can harvest dried beans. Shell them all, and save the biggest and nicest ones for replanting. Let them all air dry at room temperature for two weeks, and then store them until it’s time to eat! Potatoes are another hearty, filling food that can keep you going even with very other nutrients available. Thankfully they are quite easy to grow. In fact, you can even grow potatoes from sprouting grocery store potatoes, although you will probably get more if you purchase seed potatoes developed for your climate. No need to wait for your ground to warm up for potatoes, you can start as soon as it’s defrosted enough to dig. Plant your potatoes with two-threes eye per piece twelve inches apart. Cover them with a bit of soil. As your potato plants grow taller, mound soil or straw around the stem. This encourages the plant to produce more roots, and more roots means more potatoes. You’ll want to keep any developing potatoes completely covered from sunlight so they don’t turn green and toxic. When your plants start producing flowers you can eat the small “new” potatoes. If you want bigger potatoes, wait until the plant starts to die back in the fall and carefully dig the potatoes out. You can save potatoes to plant again the next year. Try not to plant them in the same spot though, because it can cause diseases to build up in your soil. Once you have a disease problem, it’s best to start over with new seed potatoes if you can. The handy thing about potatoes is they can be planted just about anywhere, in any sort of container. You can dig a trench and plant them in the soil. They grow in containers as well. Or you could even fill a garbage back with a mixture of straw and soil and grow them in that! Some people recommend growing potatoes in straw only, but they do grow a bigger crop if there is a more acidic environment, so mix in as much soil as you can. Tomatoes are a popular first plant for most gardeners and there’s a reason why. They’re are easy to grow in many areas, prolific, and are delicious when eaten or preserved in many different ways. Their bright red fruit can be an important burst of nutrition in a less than ideal circumstance, and even a basic salsa or ketchup can make the most boring of foods a little more bearable. Tomatoes are generally started indoors and then moved outside once the weather has warmed up. If you live in a warmer area they may spring up all by themselves as volunteers in your garden. There are many different varieties of tomatoes for all sorts of different purposes, so you may want to try a few before deciding which variety to really focus on and save seeds from. When planting your tomatoes plants outdoors, space them two feet apart in a sunny spot and plant them deep into the ground. Tomatoes are related to potatoes, and will also grow roots out of the stem. Planting a bit of the stem underground helps your plants to develop a strong root system and to be more resilient. Water them deeply once a week, and keep picking the fruit all season long! To save tomato seeds, cut your best tomatoes in half and squeeze the pulp and seeds into a cup or bowl. Add a few inches of water and let it ferment for two days. Rinse off the pulp and spread the seeds out to dry before storing them. It’s a good idea to have a leafy green of some sort in your survival garden. Fresh salads will be quite the luxury during a disaster! Salad greens can be grown in containers, directly in the ground, in shady spots, and even indoors! Some of them will even reseed themselves without any help from you and come back year after year. Plant your lettuce all season long so you have a continuous supply of it. Keep the seeds and seedlings moist, and keep them in the shade to prevent your greens from bolting. You can pull or cut the lettuce when it’s big enough to eat. Sometimes if you cut it, the roots will send out more leaves and you can get a second or third crop from the same plants. Make sure to leave at least one lettuce plant to harvest your seeds from. The flowers will produce seed heads, and the trick is to harvest the seeds when they are fully dry, but not to lose the whole batch in a strong wind! You can cut the seed heads, and let them dry in a bag to avoid losing them all. Once they are completely dry shake the seeds head out to separate the seeds from the stalk and little bits of fluff. Well, we all know the jokes about zucchini being so prolific you have to sneak onto neighbors porches just to get rid of, but an abundantly producing food source can be a real boon. If you pick a winter squash to grow such as butternut or pumpkin you can store it through the winter, and even harvest the seeds as well. Plant your squash seeds about one inch deep, with about 2-3 seeds every few feet. The exact spacing depends on what type you are growing. Squash likes to grow in heat, so make sure your soil has warmed up and there’s no chance of a frost killing it. Water it without getting the leaves wet, but try to keep the soil moist. If you are growing softer skinned summer squashes like zucchini, harvest them when small, and the plant will grow more. If you are growing thicker skinned winter squash, wait until they are fully developed before picking them. Once the vines have died, you’ll know it’s time. Squash can cross pollinate with each other, so if you’re going to save your seeds, you’ll need to pick just one variety to grow in your garden. Summer squash will need to be left on the vine so that it’s seeds will mature. Winter squash seeds are mature when the squash is. Just scoop out the seeds, wash off any string or pulp and dry them. Growing these five plants now will help you learn the skills you need to provide yourself and your family with food in the future. These easy to grow plants can keep you well fed and alive even with very few other food sources available. Learn how to start your own survival garden and save the seeds this year! Good article, growing these 5 will also go a long way to sustaining your family when all else fails.